As summer wraps up and the MLB postseason nears, the urge to play hooky from work and spend the afternoon with your favorite Major League Baseball team is strong. But, if the office calls, and you can’t make it to the ballpark, you can still show your team spirit at work. 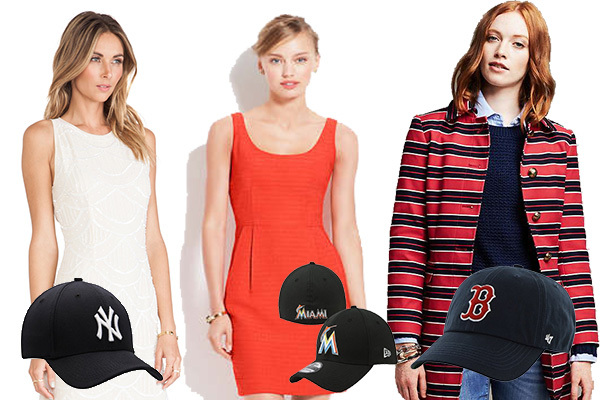 Whether your team is in the American League or the National League, show your team colors in style with these four MLB inspired looks. As summer wraps up and the MLB postseason nears, the urge to play hooky from work and spend the afternoon with your favorite Major League Baseball team is strong. But, if the office calls, and you can’t make it to the ballpark, you can still show your team spirit at work. Whether your team is in the American League or the National League, show your team colors in style with these four inspired looks from our favorite MLB team baseball caps. 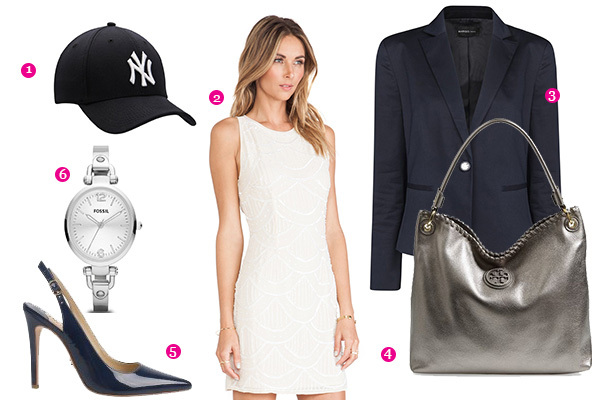 Cheer on the Yankees and look sophisticated and stylish in a white embellished dress paired with your favorite navy blue blazer. Add minimal accessories in silver to keep the focus on your dress. Add a great pair of pumps and you’re ready to go. There’s no reason you can’t stay classy at the office on game day! 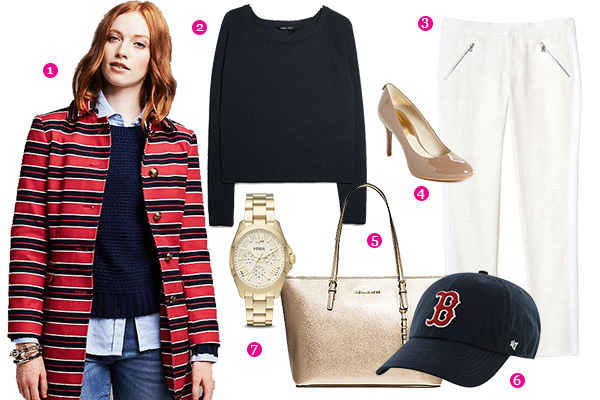 If you can’t make it to Fenway, cheer on the Boston Red Sox from the office in your favorite navy and red work ensemble. Mix in a new blazer in solid red or navy & red stripes and set off these primary colors with neutral and gold accessories for the perfect game day look. The Miami Marlins, formerly known as the Florida Marlins, have revamped their colors and logo. Show your team pride on game day by wearing orange, teal and yellow. 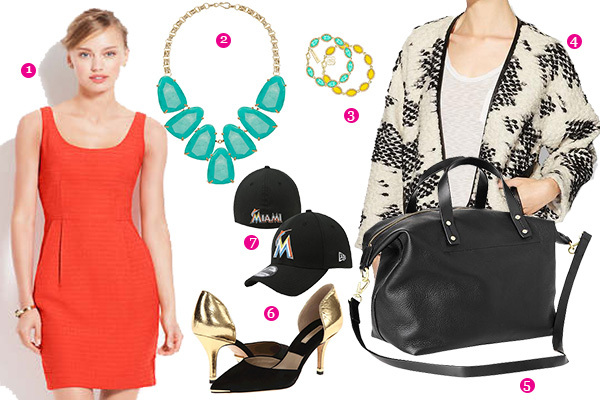 Try an orange dress, under an ivory and black cardigan, paired with yellow and teal jewelry. Add black and gold toned accessories to this bright look. 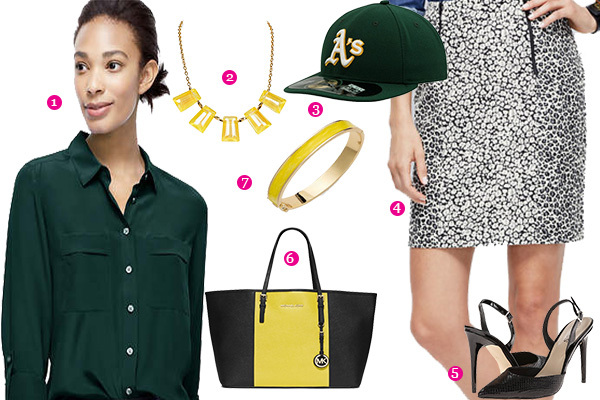 Show your pride for the Oakland A’s in a stylish green and yellow office look. Pair an emerald silk shirt with a black and white printed leopard skirt. Complete your look with a bold yellow jewelry and accented purse to show some spirit on game day.